for development of force of muscles "
(The patent of Rassia #1839735. Loading here is your body weight. 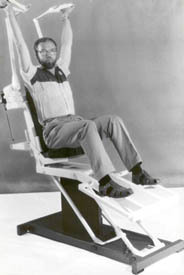 The basic lack of simulators of this class is difficulty of reception of loading over 25 % from weight engaged. 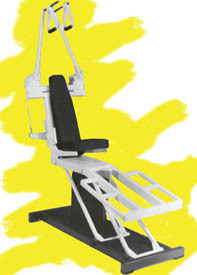 Advantage of this simulator will be, that it can load your muscles with effort even exceeding your own weight. The set of simulators of this series for 8 various groups of muscles of hands and legs has been made. 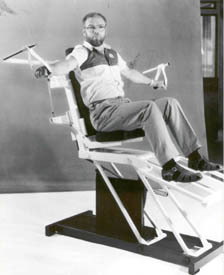 At the moment there is a variant of this simulator with the sizes not exceeding the size of an ordinary chair.